After watching The Wire you'll beging seeing visuals from it everywhere in the real world. For this assignment, capture a visual in the real world from The Wire and juxtapose it with the corresponding image from the HBO series. 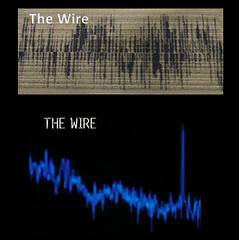 The examples shown here is a rug that has the same soundwaves of the iconic image from the show. It truly is everywhere. The Wire Everywhere: What is that thing? For my last DS106 assignment this week I decided to do the Visual assignment called The Wire Everywhere, in which we’d have to capture a prevalent image from The Wire and show a real world example. Shameless Plug or Visual Assignment? While walking around the new building I now work in at UMW—I realized I was seeing The Wire everywhere. Specifically, in the carpet.